Teak veneer plywood generally does not qualify as being a true "marine grade". That said, our teak plywood is a high-quality exterior-grade sheet laminated with a surface veneer of FEQ Asian teak that's very suitable for marine cabinetry, table tips, teak accessories and the like -- so long as your end product will not be exposed directly to the elements. 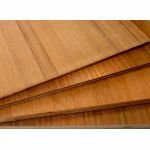 The teak veneers on our plywood are cut from First European Quality (FEQ) teak lumber, which is the best quality teak generally available in today’s market. Please understand that any cut pieces (project panels, quarter sheets) sizes can vary by as much as a 1/4" due to saw kerf when cutting sheets down, so if your project calls for sizes the same as what we offer, move to the next size up so you can get nice clean finished edges when you cut to your size.